Dubai, UAE, May 26, 2018: UAE Team Emirates’ Marco Marcato took a well-earned fifth place in today’s race, staying with the breakaway for over 175kms and crossing the line just 1:26” behind the race winner Maximilian Schachmann (Quick-Step Floors). Stage 18 was a relatively easy day in the saddle for the peloton as they travelled from Abbieategrasso on the outskirts of Milan to Prato Nevoso in the southern Cuneo area. The first 130kms of the route were pan flat, before the riders were faced with a short categorized climb at Novello and a gradual ascent towards the foot of the final climb; a 15km paved road, entirely uphill, with gradients staying constant at 7%. UAE Team Emirates’ Marco Marcato looked in great shape as he gambled early and went with the first break of the day after only 15 minutes of racing. His decision paid off as the break worked well together to stay away from the peloton for the remainder of the race, hitting the final climb 16 minutes ahead of the pink jersey group. With 10kms to go Marcato attacked the breakaway, dropping three riders. With 8kms to go he was at the front of the race with just six others; the pace was fast and the attacks were frequent, with UAE Team Emirates’ front runner matching each one. 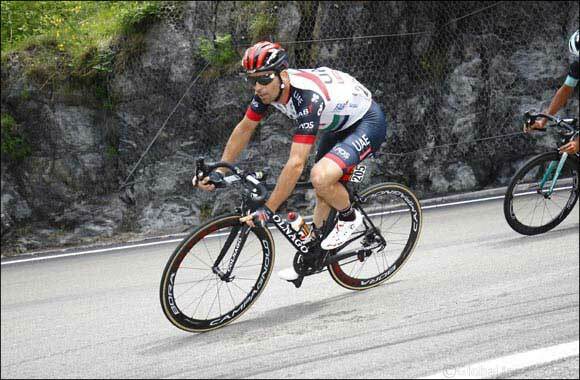 Eventually he lost the wheel of the final attack and came in fifth place – a respectable position for a rider who doesn’t specialise in climbing. Commenting on his performance, Marcato said: 'The arrival, with the summit climb, was not completely suitable for me, however I was in a good position when the breakaway went clear and I decided to go with them. The attack's advantage became larger and larger and we had the chance to battle for the stage victory. On the climb to Prato Nevoso I tried to give my best, but my opponents were stronger climbers'. Tomorrow’s stage takes the riders into the mountains once again as they face the penultimate summit finish of the Giro. The 184km route from Venaria Reale to Bardonecchia boasts no less than four categorized climbs; the second of which, Colle Del Finestre, features a 9.2% average gradient and 45 hairpin bends over an 18km stretch – with the top 9kms being ridden entirely on gravel roads. After a manageable third climb up the Sestriere, the route descends into the Oulx valley before making its way towards the Jafferau- a short, sharp ascent with 9-10% gradients that top out at 14%, making this a tough finish to a punishing stage.